This grade counts as a bonus. 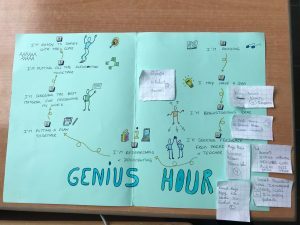 During genius hour, you work on a project that you like and learn English at the same time. – Ask for permission before going out. You are expected to be in class on time every day. As mentioned in the school rules : you are given a 5 minute passing period. If you are less than 5 min late, you need to get a tardy pass at the vie scolaire, if it is more than 5 min, go to the study room. If you are absent, you are responsible for making up the work missed. It will be written in pronotes. You just need to login online. Assignments need to be submitted on time. For each day an assignment is late, 2 points will be deducted. And a very good excuse should be given. After 3 days, the assignment will be graded 0/20. After 3 days, you can still submit your work but for feedback purposes only. You are responsible for logging in pronotes to check your grades. If one is not correct, tell me ASAP. Changes will not be made 8 days before the staff meeting («conseil de classe»). Surf the web, write blog entries or chat in English, visit anglaisbac.com regularly. Copyright © 2019 L'anglais au bac.